I have a question. My friend and I heard of a "castle" that was off limits to the public by the government and it isn't on maps and all that very well hidden. It was rumoured to be a drug lord named Faymores castle so we were bored and we checked it out. It was supposed to be 2 miles in the woods past the very end of loraine road ( the main road in north eastern ohio ) THERE WAS A CASTLE! 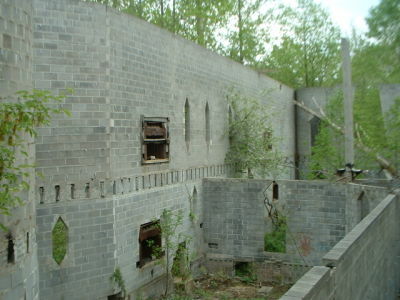 it took us like 6 hours to find it but it was there, goto http://www.angelfire.com/crazy/cjscastletrip/faymores_castle/index.album?i=28 to see the pictures, I would just like to know some background on it and see what it used to look like in its day. It looks to me like it was never finished. Does anyone have any information about this interestig place?